The video of the incident has gone viral on Facebook. The video shows an elderly man dressed in religious robes attempting to feel a girl's exposed thigh by rubbing the fingers of his right hand against her. The girl, who is seated next to the elderly man, appears to be asleep. As such, she seems to be unaware of her abuser's actions and doesn't move. Speaking about the incident, she said that it happened when she was on her way back to work in the Sri Petaling LRT Line. "He stopped when he noticed the Malay couple beside me eyed him. He straight away got off the train at that stop," the female passenger added. While the original post containing the video was taken down by the female passenger, the video was later uploaded to several Facebook pages. 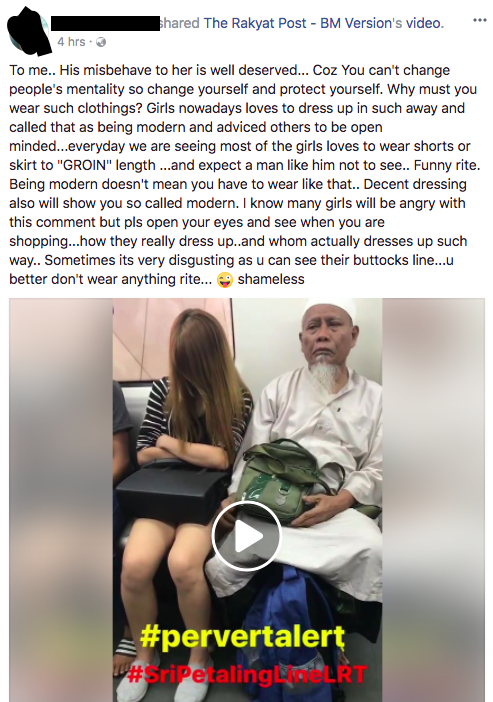 "To me, his misbehave to her is well deserved," commented one Facebook user, who shared the video on her wall, adding, "Why must you wear such clothing? "Girls nowadays love to dress up in such a way and call that as being modern. Every day we are seeing girls who love to wear shorts or skirt to "GROIN" length and expect a man like him not to see. Funny, right?" Her comments were endorsed by others, who said they agreed with her points. Another user who commented on the video, asked: "how come the girl didn't feel anything? ", while one commentator said to "believe and trust in religious men." 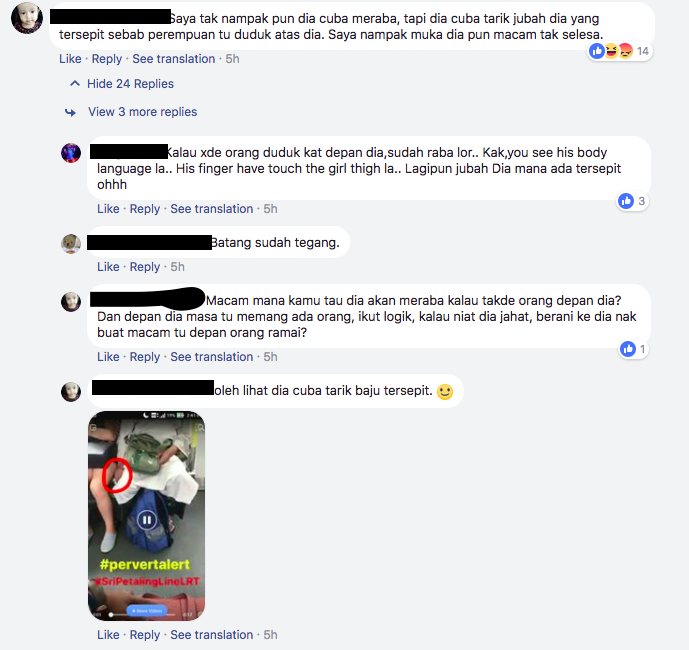 Meanwhile, one Facebook user said he is not touching the girl and was trying to pull his jubah. But because the girl is sitting so close to him, he feels uncomfortable. "How many more victims are needed till they step up their safety and procedures?" The 17-year-old victim has alleged that she was gang-raped by nine Malaysian soldiers. The video has been shared by Malaysians on Facebook groups.